36 years in the harvest! Last week's wheat field is gone with the wind! In one day the wagon loads of grain were hauled away. 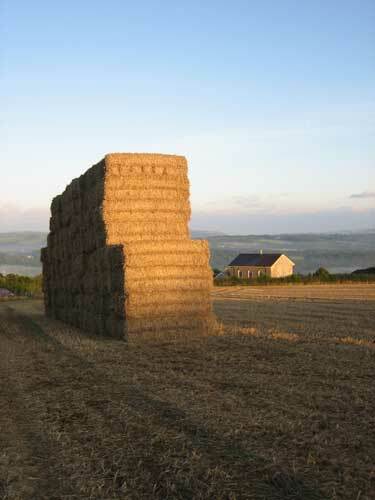 Then two days later all sixteen acres worth of straw was packed into large bales and neatly stacked in the bare field. I remember wondering during my prayer time one morning if there were as many grains of wheat in this field as there were people on the earth. It was an interesting and very graphic representation of a lot of people to pray for! The whole idea of harvest is good food for thought, meditation and prayer. In Matthew 13, Jesus teaches about sowing and harvest. And in the parable of the wheat and the tares, He says that the wheat will be gathered into His barn. What a sobering yet encouraging thought! And furthermore, explaining it to His disciples, He says "the harvest is the end of the age" and "Then the righteous will shine forth as the sun in the kingdom of their Father. He who has ears to hear, let him hear!" That should make us intent and attentive to hear His voice every day indeed! It has also been a good focus for our prayers here for revival. We are pressing into God's heart for the coming outpouring, and have had more reinforcements again since I last wrote. Last week we were joined by a couple from England, and then again yesterday by a pastor and his wife from North Wales. And even today we've had two other contacts from people that want to pray with us here. Besides reinforcing our own prayers, we are also sowing into the churches and communities of those that contact us. We have been blessed to pray for them and encourage them to carry a fresh annointing and hunger for prayer back with them. Prayer really does change things. There was one little group of devout prayers, including my mother, that prayed for me regularly for nearly eight years! And as a result of their dedication and perseverance, thirty six years ago today, the grace of God came into my life and I was born again. And today I am very mindful of and thankful for that glorious encounter with Jesus that changed my life abruptly and forever! (And thank you Kersti, Bob and Tom for introducing me to Jesus "back in the day.") And I know that those prayers so many years ago are still bearing fruit in and through our lives today. I would never have imagined back then, nor those faithful praying ladies either I'm sure, that we would doing what we are doing now in Wales! It is harvest time at home too. 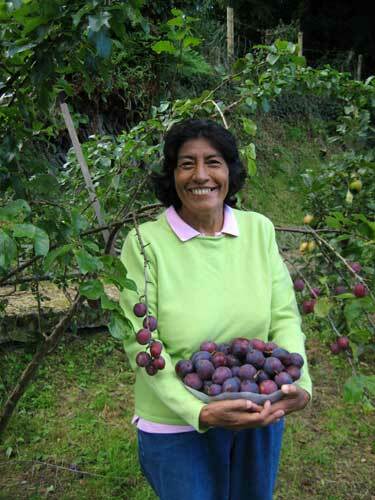 Here is "Gladys the plum lady" with a bowl of fruit from our "inherited" trees - plums and apples. This is a special time of year when the land yields its produce, and we are able to share with friends from the abundance of God's gift of provision to us from the earth. Vegetables, potatoes, sweet corn and more, make their way from home to home as we share of His love and provision with one another. As we enjoy the fruit of the land directly from plant or tree, it is a good reminder also that we all depend on God alone for our sustainance. He makes the rain to fall on the just and the unjust, and makes no acception of persons in this material provision. Although in some parts of the earth there is draught and scarcity, other places have abundance enough to share if only men would truly love mercy and do justly. And so too we are called upon to share of the Bread of Heaven with those in need around us and around the world. That is our privilege and duty. With strong crying and tears . 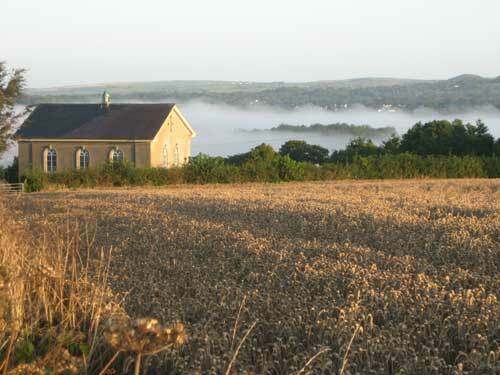 . .
How our hearts stir with longing for God's presence to fill this land as the morning fog fills the Teifi valley that lies beyond the chapel. The golden grain is now ripe and waiting for the harvest, and urges us on as we pray for the people in the surrounding farms and villages. Over the last few weeks in times of worship I have been deeply moved as the Lord's infinite loving care for us has swept over me and His presence engulfed me like the fog has this valley. As wonderful as this is, at the same time my heart has been absolutely broken with yearning for the thousands upon thousands of wayward souls that ignore God's love and the pure joy of worshipping Him in spirit and truth. In times of deep heart-felt worship and prayer like these I think we begin to get a taste of the heart of our own high priest Jesus, who ever lives to make intercession for us. In Hebrews 5:7 we are told that "he offered up prayers and supplications with strong crying and tears to Him who was able to save Him from death." Again we can see the heart of our wonderful shepherd and savior in Luke 13:34 when he cries out, "O Jerusalem, Jerusalem, which killest the prophets, and stonest them that are sent unto thee; how often would I have gathered thy children together, as a hen doth gather her brood under her wings, and ye would not!" Like a safe harbor from life's storms, God's love and forgiveness have been made available to all who will come to Him. The cry of His heart is ongoing, and reaches out with tender mercies towards the lost and dying peoples and nations of the world. His invitation to all of us, His children, is that we join Him in crying out for the nations, and that our hearts would be moved with the things that move His. Our lives, like His, are meant to be lived in thankful worship for His goodness and as unceasing prayer for His will to be done throughout the coming harvest. Looking unto Jesus . . .
As summer seems to be drawing to an end here (although some might well say I'm being too generous with that description! ), we see the hint of changing colors in the trees and the days are noticeably shorter now. The roads are less busy too as most of the holiday travelers are gone and children have started back to school. Our own schedule is settling down again as the flurry of summer visitors comes to an end. 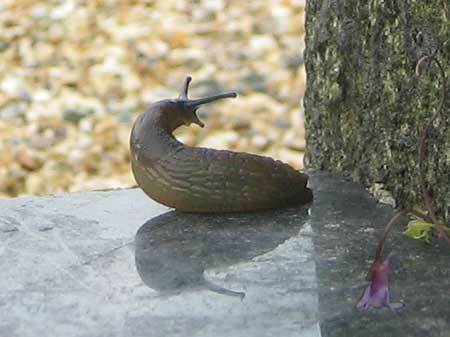 And like this little creature in the cemetery has lifted himself up and is looking around in a new direction, so we are anticipating what more of God's goodness awaits us with the changing of the seasons. We have been enjoying a few fresh vegetables from our garden, although the summer didn't provide as much sunshine and warm weather as we wanted. However it was slightly better than the last two years, and there were some beautiful days to be enjoyed. We are grateful for the Lord's goodness to us, especially Gladys. Last winter she wasn't even sure she'd be well enough to work outside in the garden, but she has been so much better and has enjoyed feeling more like her old self again. Thank you again for your love and your prayers on her behalf! One of the things that has been standing out lately in my prayers and thoughts has been the town of Blaenau Ffestiniog that I have mentioned before. We haven't had any recent contact, and perhaps will be able go up again to pray there again before long. So please do continue to pray with us for what plans the Lord has for that place. If you'd like, you can see a short video that one of our Korean friends took of a prayerful encounter in the rainy town center when we were there last month. 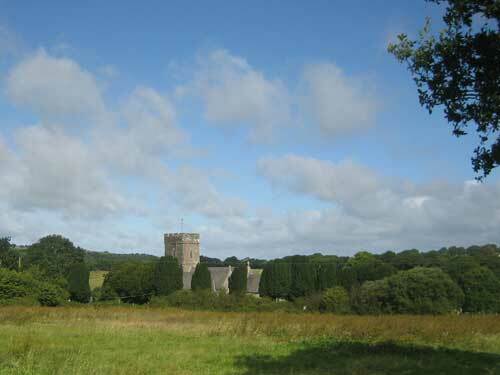 Just to prove that it isn't always cloudy and rainy, here is a view of the church in Cilgerran that I snapped the other day. 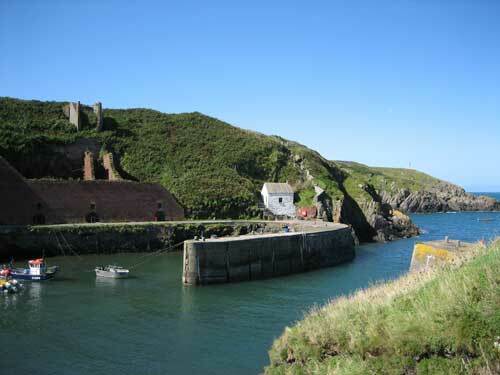 Sitting on the edge of the river gorge, it is a typical landmark in so many villages throughout England and Wales. Sadly, like the chapels, many of these old church buildings are either closed, or combining meetings of different villages and moving from place to place on Sundays. Rather than seeing these old buildings as relics of the past, I rather see them as promises of the future. 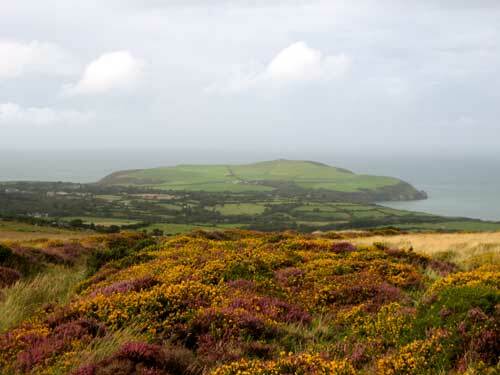 Perhaps for now most people still ignore them, but the physical prominence of churches and chapels throughout the British landscapes is not just history. I believe they stand here as a reminder of great things to come, and a challenge as well to all believers here to keep our hearts and voices raised in prayer and supplication for the coming outpouring of God's spirit.Who can resist when our prayers agree with Joel 2:28-32, "And it shall come to pass afterward That I will pour out My Spirit on all flesh . . . Before the coming of the great and awesome day of the LORD. And it shall come to pass That whoever calls on the name of the LORD Shall be saved."